We've all had them, grilled chicken salads with dry, tasteless chicken. 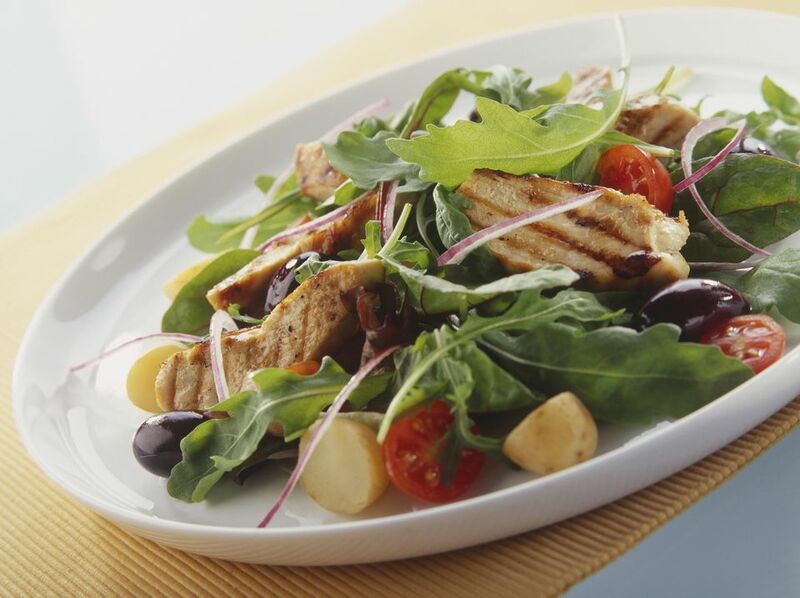 Ideally, adding chicken to a salad should make it a tastier and more satisfying meal. Unfortunately many restaurants, fast or not, think that chicken should be cooked dry on a hot metal sheet. That's no good. We want tender, succulent chicken grilled with flavor and smoke to top a salad that complements and doesn't drown out the chicken flavor. The most important thing you can do to grill chicken for a dish is to marinate it. Not only does it add moisture and flavor but it makes the chicken healthier for you. The great thing about marinades for grilled chicken salads is that you can use the dressing for the salad as the marinade. Oil and vinegar dressings and vinaigrettes make excellent marinades for chicken. Just remember to discard the marinade you used on the chicken when you are done with it and not to let the raw chicken come in contact with the dressing you use on the salad. When grilling chicken for salads it is especially important to make sure that no other ingredients come in contact with the raw chicken and that you have everything that does cleaned before you start working on other ingredients. You also want to make sure that the chicken is properly done. Generally, the chicken on a grilled chicken salad is chicken breast. You can use a thermometer to test for an internal temperature on 165 degrees F., cut the chicken open to make sure that there is no pink left or closely watch the juices. When the juices from the chicken run clear the chicken is done. Once the chicken breasts are properly grilled you need to cut them into thin strips. I find it best to cut the breast meat at an angle against the grain. I know you've been told to cut with the grain but you don't want to have to eat your salad with a knife and a fork. Cutting against the grain of the meat makes it much easier to eat. Cool the chicken pieces in the refrigerator and assemble the salads once the chicken has properly cooled. Chicken pieces can be prepared in advanced and refrigerated for a few days.